From watercoloring to drawing, craft work, and beyond, an art desk is an indispensable tool to add to your studio. 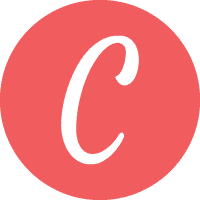 But selecting the right one for you can be a bit difficult – especially given the amount of options available in the marketplace. 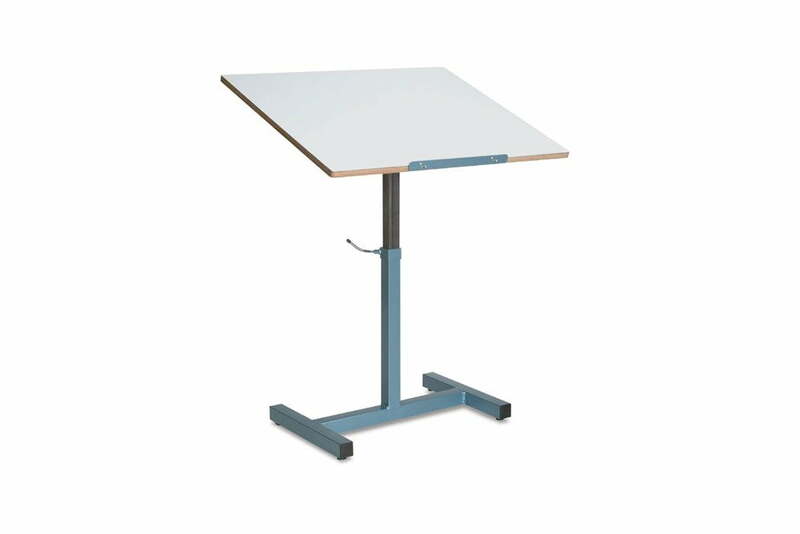 Trademark signs of a quality art desk include its range of tilt, easy access to essential supplies as needed, height adjustment, pencil ledge, and ample surface size – like the Studio Designs Futura Craft Station. Below we not only go over some key factors that you must consider before purchasing an art desk, but we also guide you on how to spot a quality desk from a far. In addition, we review a few of the most popular and highly rated art desks currently available along with a few tips to get the most out of your next desk. One of the biggest constraints artists have around selecting their new art desk will be size. Your studio or living area will likely dictate the type of desk that you end up going with. As you can see in our table above, the width and heights can vary greatly – so be sure to measure out the space you plan on placing the desk before ordering. Secondly, many art desks can adjust their height for greater comfort – so be mindful of this key measurement in order to ensure you have proper overhead clearance. With art desks you will see that they come in a variety of finishes which include aluminum, MDF, maple, rubberwood, teak, etc. It’s important to note that there isn’t any one material that stands above the rest – and that this will primarily be a personal choice. So, take a minute to think what works best with the rest of the home décor along with your preferred working surface. When buying an art desk, you will see that some include stools while others may require you to purchase a chair separately. Not only may this require you to extend your budget, but it’s another purchase that you might want to make together so you can get started right away once both arrive. Now an important consideration that you will want to think about when purchasing or using an existing chair will be the height of the arm rests (if applicable). Some desks may be a bit shorter, so make sure that the area is high enough to slide your chair under. Depending on your use case for the desk, you may be interested in different add-ons. During our research we found that some companies (specifically Studio Designs), make various accessories that work with their wide lineup of desks including leg extensions (so it can be used as a drafting desk), along with light pad support – for tracing and animation purposes. 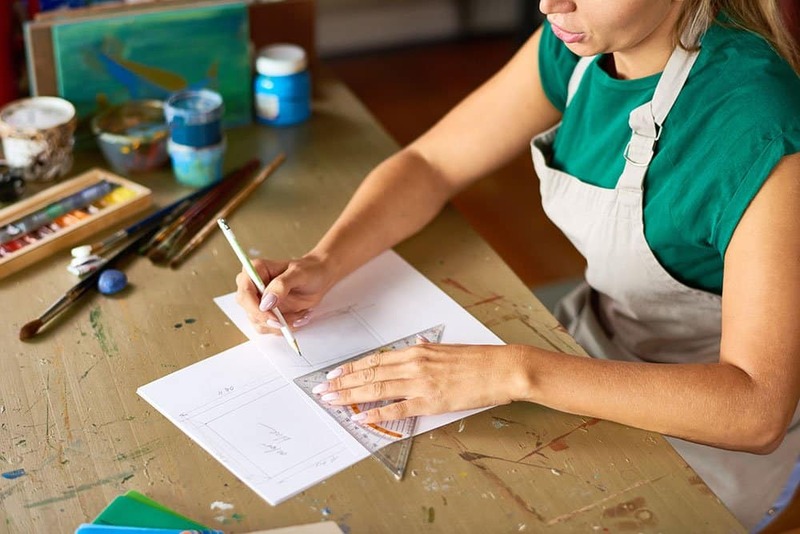 While these may be for specific use cases, should your art career take you in one of these directions, you will be happy to know that your desk could be retrofitted to accommodate you easily. The quintessential feature in an art desk is tilting. With the surface able to conform to your comfort, tilt will be among the most important factors to consider when buying an art desk. As we provided in our chart above, each desk will not only rest completely flat, but will also have a maximum tilt angle. We found that most artists are pretty happy if a desk can tilt at least 35 degrees. One of the most popular art desks on the market is this craft station by Studio Designs – it simply had many of the key trademark features that artists require out of their art desk including – a full range of tilt (up to 35 degrees), onboard storage, easy add on extensions (extra cost), along with a variety of surfaces to choose from. But even beyond having all the bells and whistles that you might be looking for, it generally was well liked by artists from completely different backgrounds including those who love to water color, draw, and even model paint. One of the key aspects that we loved most about this desk, and something we think you will love as well, is the working surface area. 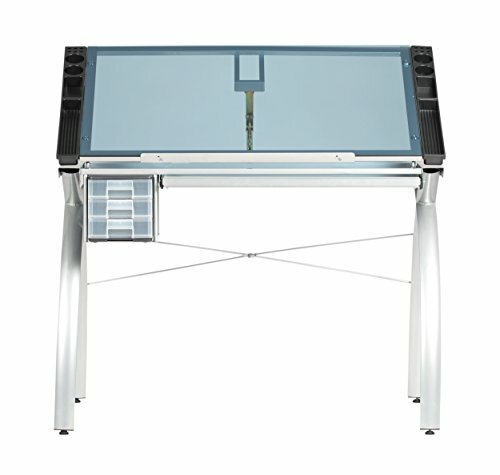 A .25” single pane of glass is completely absent of any joints and provides a silky smooth and firm surface for your drawing tool of choice to glide on with absolute ease. Not only will this translate to better results in your artwork, but it will be super comfortable to draw on. But what really makes this desk even better, is that the storage is easily accessible and organized on both sides of the glass – so you can quickly grab your drawing tool and get on with your work. If there were any downsides that we came across in our research on the Futura Craft Station it would be assembly. Some folks said the instructions were a bit vague – so simply set aside a few extra minutes when it arrives. Overall, it’s a perfect art desk for both beginners and professionals alike. The smart design has all the essentials that you should expect in a quality art desk. A perfect budget desk for beginner or student level artists, the ZENY art desk has everything for starting out. First up the storage – this is where the desk really shines. Underneath the surface you have two large drawers that are perfect for the rarely used supplies. To the left of the surface you have a small ledge that can be used for a variety of applications including holding your laptop, a model, jars, etc. Then next to the surface on your right you have a few storage trays, pencil holders, etc. for quick access while working. 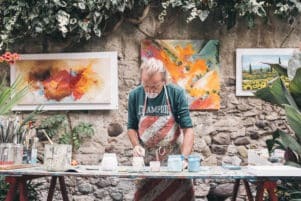 All of these work to really compliment you as an artist and allows you to concentrate on your work rather than worrying where to set your stuff down. Now with the surface itself, some of the purists may not like that it’s constructed from MDF rather than a single slab of oak or maple, but given the lower price point on this desk, it’s to be expected. While it’s an MDF surface, the veneer is superb and will still be an incredibly smooth for you to work on. Sure, it’s not likely going to be an heirloom piece you can pass down for generations, but for most of those reading, it won’t be a big deal. Given that this desk retails normally under $100 bucks – it’s one of the best value picks on our list, and the primary reason why we found it to be among the best art desks on the market. Overall, if you are an artist just starting out and want a dedicated workspace, you will be plenty happy with this art desk from ZENY. 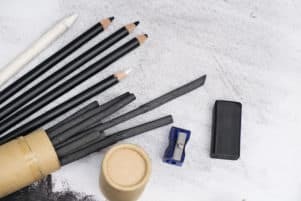 Minimalist and affordable, the OneSpace Craft Station is a terrific pick for those artists who want just an easy to use drawing surface and not much more. Sure, it does come with a few light storage options including the two drawers underneath and two side storage trays next to the surface, but what many loved about this desk was the oversized no-frills glass surface. Like the Studio Designs Futura Craft Station we also reviewed, the glass surface on the OneSpace Craft Station is extremely smooth and versatile. Working on this surface will not only be comfortable, but will translate to clean and precise lines while you are working. The included ruler near the bottom ledge of the surface is also perfect for those using this for drafting purposes and need to get quick measurements without having to reach for their ruler. 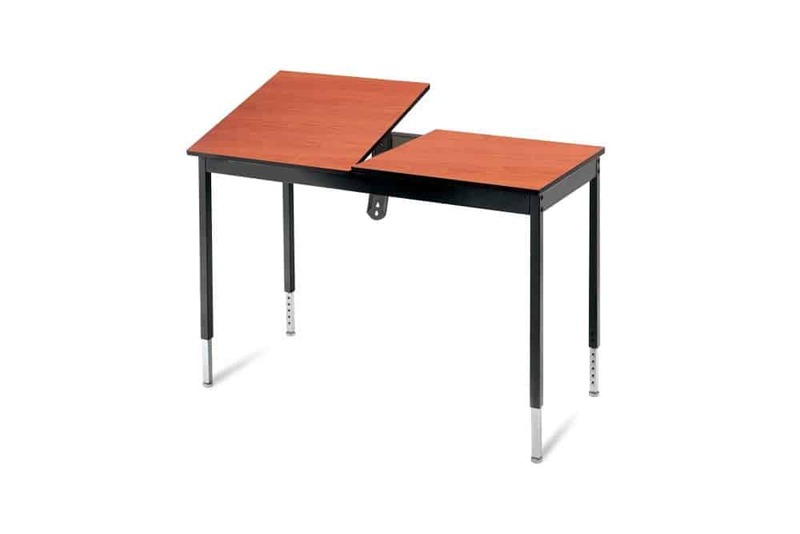 Beyond the surface though, two features that really set this desk apart from many of the others on our list is its maximum tilt and inclusion of wheels. With the ability to go all the way to 62.5 degrees, you should never have a problem finding the perfect angle for your drawing comfort. Secondly, the wheels make this desk uniquely portable. So, if you need to move your station around your studio, room, etc. regularly – the included wheels (which also lock), make it really easy. Overall, for the competitive price and the artist friendly design, the OneSpace desk is a perfect station to make you a better artist. Those are the two words that come to mind with this tilt-top art desk by Klopfenstein. This no-nonsense art desk is there to serve the artist and nothing more. Absent of any shelves or drawers, some folks looking for dual use from this desk may be disappointed, but for the others that are looking for a smooth and reliable drawing surface, it doesn’t get much better than this. You can select the right size for your studio. Surface area aside, the subtle details are what we really loved above this desk – including the rounded corners of surface, full 90 degree tilt, and a height adjustment that can be dialed into your exact preferences. Furthermore, the surface features a ledge, like most art desks should, that will catch your pencils, pens, etc. from sliding off. But while a ledge might seem standard, what isn’t standard is that it can be adjusted to drop out for increased customization. Overall, this table doesn’t mess around. 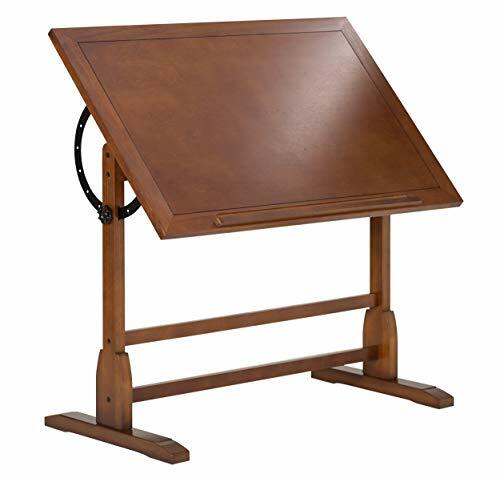 While the price is enormously high – it’s perfect for those artists looking for a drawing table that they will never have to replace. 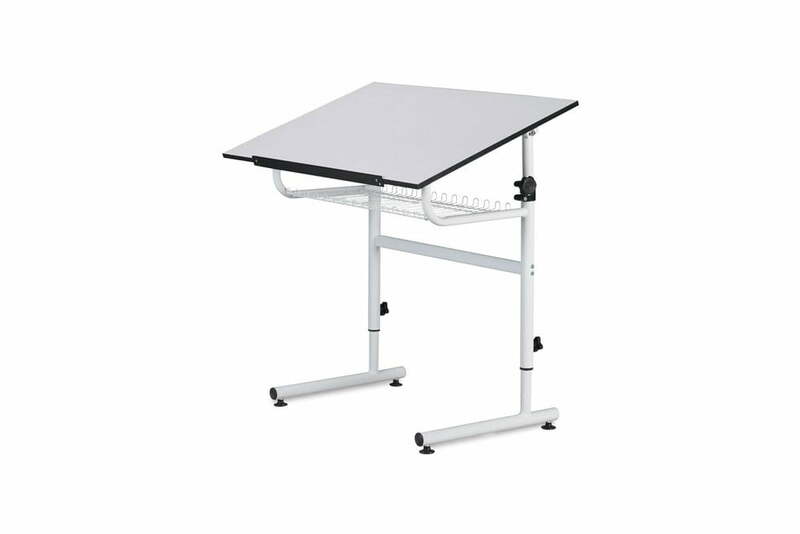 Should the Klopfenstein be just a bit too much for your art budget (no worries, we aren’t all made of money), then this Martin Universal Design Drafting Table is the perfect alternative. Featuring many of the same minimalist characteristics as the Klopfenstein, it’s a perfect value pick. Crafted from stainless steel, it will set firmly in its place and resist any budging when being used. While absent of any wheels, it only weighs 27 lbs. making it rather easy to move around a studio or room by yourself when needed. The height of the table can be adjusted anywhere between 28.5” and 35.5” for ultimate comfort. Underneath the drawing surface, you do have one large metal cage to hold your larger supplies. So extra notebooks, small bags, etc. 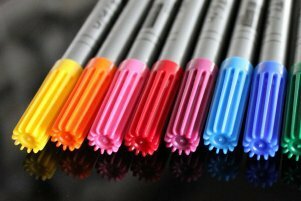 will all be perfect for this area – just not individual pencils, pens, etc. Now if there were any drawbacks to this particular table it would be the tilt adjustment. Of all the desks we looked at, it is among the most limited with a max tilt of 40 degrees. While not a deal breaker for many, it’s worth noting this important restriction. Overall, for a sub-$100 price tag, this is a great desk for those artists who want less in the way of extras and a really good surface to do their artwork on. …but in a really good way! This bi-top desk is the perfect pick for those who like to get a bit more utility from their art desk, while also doubling it as a computer workstation. With two identical surfaces measuring 24” x 24” (or 48” x 24” when both flat), you can easily set your computer on one half of the desk, while drawing on the surface of the other. 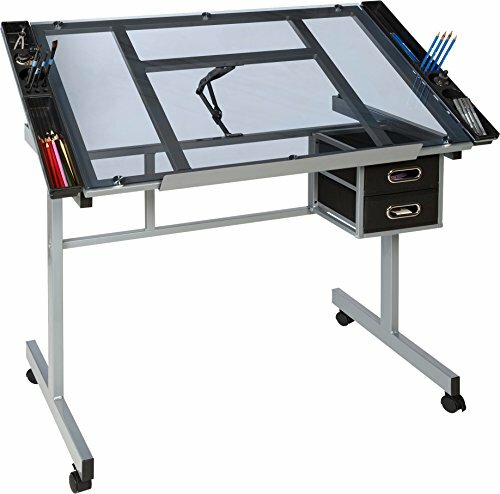 Not only is this great for drawing while referencing your computer, but it can also be an incredible desk to use for digital painting or even streaming on Twitch. But as cool and unique as this desk is, it’s not without a few drawbacks that may be deal breakers. First, the lack of any drawers. So, if you are planning on using this as a half computer half art desk, know that any external keyboards and mice will have to take up valuable surface real estate. Secondly, the drawing surface tilts to a maximum angle of 45 degrees. This likely isn’t a big deal for most reading, but at least worth noting. One of the more expensive picks on our list, the Smith System CAD Station Graphics Art Table does have a hefty price tag – so it will be for serious artists only. Overall, this is a simple desk that can prove to be incredibly useful and a huge productivity gain for the right artist out there looking for a desk with a specific use case. We were a bit torn on whether to add this art desk to the list – primarily due to the purpose it serves. As both a decorative and functional piece, it’s a unique offering that may be great for the artist out there that are looking to add a new piece of furniture to their home while also wanting to get a reliable drawing surface at the same time. Crafted in India from teak wood, it’s a beautiful piece that can add that rustic farmhouse design flare that is all the rage today. But our goal here isn’t to concentrate on the interior design aspect of the craft table, but to rather look at it from a working artist perspective. Overall, the desk does have some key limitations. The height of the table is fixed, however, the angle of the table can be dialed in to your personal level of comfort. For the working surface, it’s massive. …which also means that it is heavy! Weighing in at 250 lbs., moving this around your home or studio will either take a team of movers or a few really good friends to help out – the lack of wheels on this table means you won’t be able to easily do it yourself. Overall, this table is a dual piece and one that should only be considered for artists who also would like to add a beautiful piece of furniture to their home. When it comes to utility, it definitely has some limitations. 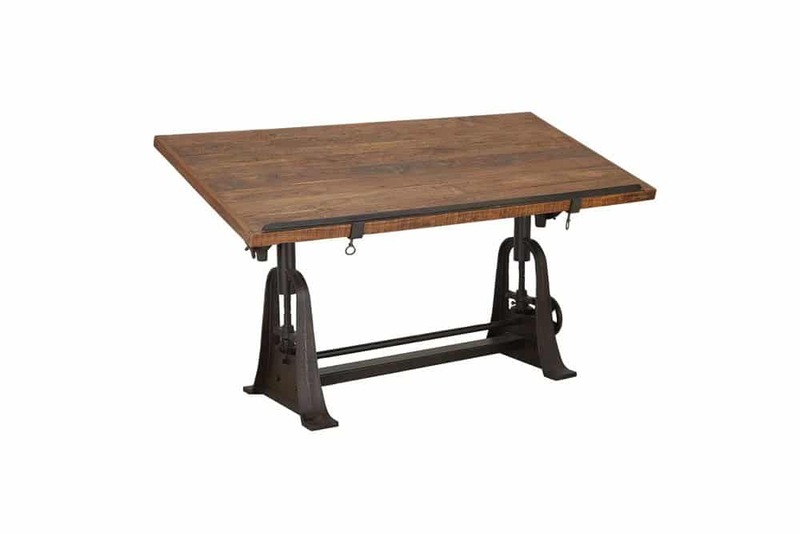 Squarely between a traditional art desk the enormous Rustic Rectangular Drafting Craft Table you will find this old-world inspired offering by Studio Designs. As we loved their Futura Craft Station that we also reviewed in this article, the Studio Designs Vintage Drafting Table turns heads again with this offering. A perfect addition to most homes, this art desk can easily compliment most styles without looking too industrial or modern – while still serving as an art desk extremely well. Not only does it look nice, but it’s made from uncompromising materials as well. Cut from solid wood (not pressed), it should have no problem withstanding years of abuse. But given the full wooden frame, there are undoubtedly going to be a few limitations. With a fixed height of just under 35”, you are limited to chair and table comfort. Now if you do want to have the stool that matches this desk, you will have to pay for that separately – and can purchase it here. The second key limitation to this desk is storage. Absent of any drawers or trays, you will need to store your drawing or painting supplies separately. But all is not completely lost! One of the standout things we loved about this desk, beyond just the beautiful aesthetics, was the tilt. Able to go a full 90 degrees, you can easily get your preferred level of comfort. Overall, this is a perfect desk for the artists who might be drawing or painting occasionally in a shared space (i.e. living room). While it has a few key limitations, it still can function incredibly well. Another utility and furniture piece we reviewed was this art desk by Alvin and Co. 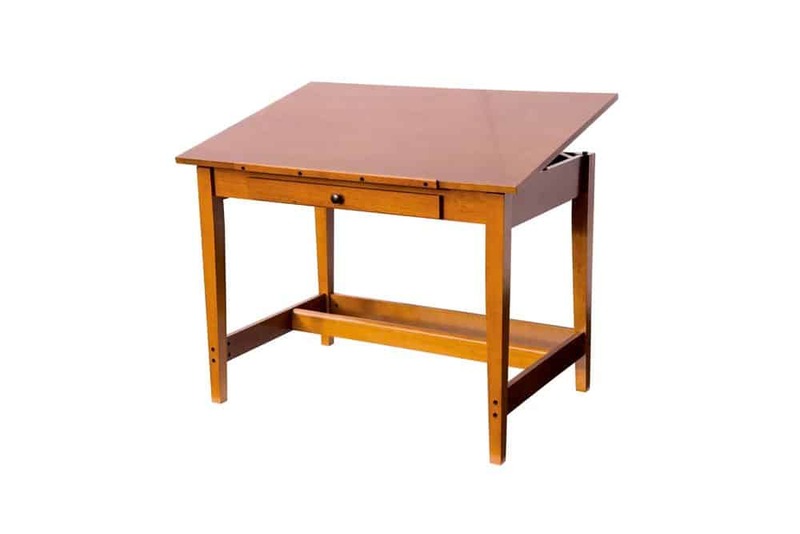 Both a terrific drafting table and full-fledged desk – this surface is perfect for student artists and those who also want to invest in a new piece of furniture. This fixed height (33.5”) desk provides an huge work area of 48” x 36” (rivals the large version of the Klopfenstein table we reviewed). Made from solid rubberwood, it will last a lifetime. But what we really loved about this table was two key features – the precise mechanical tilt that can dial in your preference anywhere between 0 and 45 degrees and the storage. Underneath the desk top you have a huge storage area – making it a perfect pick for artists who don’t want to have a separate set of drawers to keep their drawing tools organized. Lastly, a little detail we also liked was the pencil ledge. While it doesn’t extend the entire width of the table top, it should catch just about anything that may be about to slide off. Overall, this is a perfect piece to not only add to your art studio, but home as well. While fixed height is expected in this type of offering, the full tilt range and ample storage are a huge selling point. Should You Get An Art Desk With Storage? This really depends on your specific scenario, and one you will want to take a minute to think about before you hit that buy now button. If you have a cabinet or bag that you are already using and that it serves you well, then onboard storage likely isn’t a huge deal. But if you are like us and prefer a bit of organization in your life to increase productivity, then any of the above offerings with storage should be great. 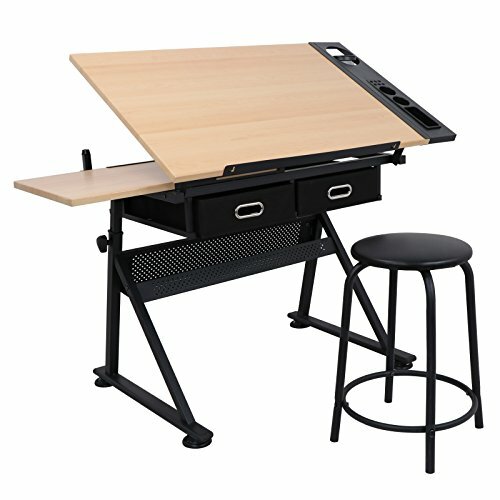 Is There Any Chairs That You Would Recommend To Go With An Art Desk? While we eluded to it just at the start of this article, we would want to point you to a post we had written on the best art chairs. These are chairs that were extremely comfortable and will allow you to concentrate fully on your work rather than your posture when making art. Where To Buy An Art Desk? During our research we found that many online art stores had a surprisingly limited selection when it comes to art desks – although Blick Art Materials did have a few. However, we found that many interior design retailers had quite a wide offering available – a few that we came across include IKEA, Wayfair, Hobby Lobby, Walmart, and of course Amazon. Finding the best art desk in 2018 proved to be rather tricky. With so many retailers and options out there, cutting through the poorly rated ones to find the truly standout offerings that artists loved was tough. But after several hours of research, we are confident in our selection and we think you will be pretty happy with any of the above. We hope that this article and guide on the best art desks served you well, and hope you enjoyed reading it as much as we did writing it!